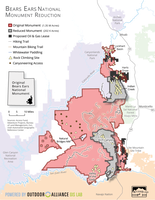 Recently the president signed a proclamation to drastically reduce two of our national monuments in southeast Utah. Check out what this means for The Mountaineers, public lands, and the outdoor experience. You’ve likely heard the news: the President signed a proclamation to shrink two of our national monuments, Bears Ears and Grand-Staircase Escalante, located in southeast Utah. In total, the proclamation cuts 2 million acres from the monuments. So what do these drastic reductions mean for The Mountaineers, public lands, and the outdoor experience? Suffice it to say, there’s a lot at stake. If the proclamation stands, a dangerous precedent will be set: national monuments can be altered at the whims of an administration. It will fundamentally weaken the Antiquities Act, the bedrock conservation law that grants presidents the authority to create national monuments to protect cultural, natural and scientific resources. No administration has ever challenged the Antiquities Act like this. The outdoor experience hinges on laws like the Antiquities Act to protect our public lands. This is an issue that speaks to the core of our conservation values. We'd like to extend a big thank you to the 4,400 people who responded to our action alerts and joined us in advocating for our national monuments. It’s not over yet! Check out the resources below to learn more about where we’re at and what’s ahead. 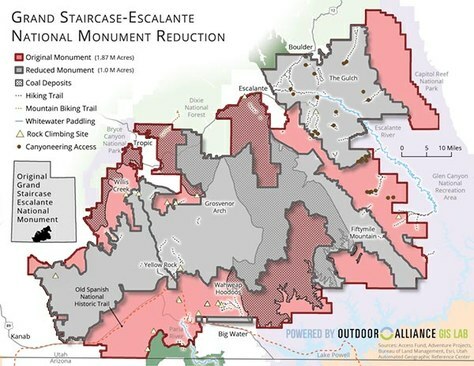 The proclamation reduces Bears Ears to 16% of its current size and Grand Staircase-Escalante to 53% of its current size. The chunks taken out of the two monuments align with areas tapped for oil, coal, and uranium extraction potential. 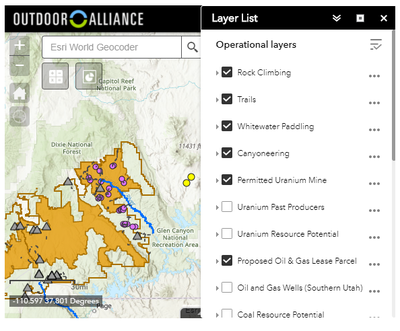 To learn more about the reductions and their effect on outdoor recreation, local economies, the environment, and archaeological sites, check out our partner Outdoor Alliance’s interactive online resource. Several lawsuits are challenging the proclamation. To learn more about the tribes and recreation and conservation groups taking this to court, check out this break down by the Salt Lake Tribune. The Secretary of the Interior has recommended reducing the size of two other national monuments and changing the way ten others are managed. Check out this piece by the Washington Post for more about what might be in store for other monuments. Want to learn more about YOUR National Monuments, so you can be a strong voice for our public lands? Test your National Monuments IQ by clicking through this fun quiz.